Cast iron grates are a great way to up your grilling level. Cast iron has a much higher thermal capacity than the standard grill grates. When that heat is unleashed onto a juicy porterhouse, the result is an amazing set of dark mahogany grill marks that only cast iron grates can offer. The Weber charcoal grill is the one to have and everyone knows it. Even though Weber doesn’t offer a full cast iron grate of her own, there are several fantastic cast iron grate options available for all sizes of the Weber charcoal grill. Except for the Ranch, there are no cast iron options for that. 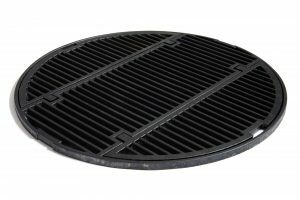 Can you imagine how heavy a 37″ cast iron grate would be? Oh my damn. The Malory grate is the newest cast iron grate to join the party. This grate is similar to the Napoleon grate, but without the weird wavy grill marks. 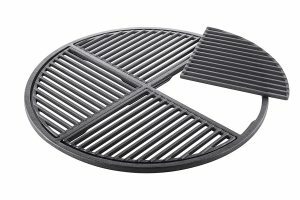 The Malory cast iron grate is only available for 22″ Weber grills. The cast iron bars on the Malory grate are thick and heavy. There are two hinged portions on either side for quick access to charcoal without physicaly removing the grate. The Napoleon cast iron grates have some cool features not found on other cast iron grates. Handles on each side make removing the grate much easier while hinged cooking areas make it easy to add fuel without removing the grate. The cast iron bars are wavy! This may be a pro or a con for you depending on how you prefer your grill marks. 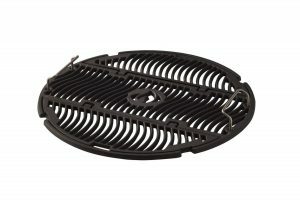 This cast iron grate requires the use of the Weber Gourmet Grate with the center insert system. The Weber Gourmet cast iron insert is heavy duty cast iron with a porcelain coating for quick and easy maintenance. The insert has a gorgeous diamond pattern sear that will put perfect grill marks on your steak. The Aura is a one-piece cast iron grate for the Weber 22″ charcoal grill. The Aura grate uses thinner cast iron bars than others and there have been a few complaints of this grate cracking. 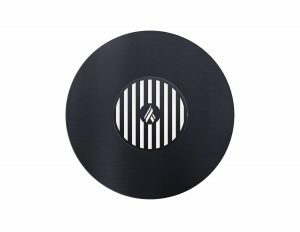 I’m including this carbon steel cooktop and grate is a unique add-on for your 22″ Weber. The outside is a griddle surface while the inside is a grate. I don’t own one of these but I’ve heard from several WKC members how amazing it is. These Stok brand cast iron grates are made for a different grill, but fit the 22″ Weber perfectly. The grates are porcelain coated cast iron, so you don’t need to worry about seasoning and rust. The center section of the grate is removable and big enough for a charcoal chimney to sit. 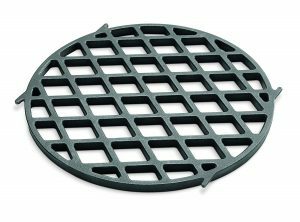 The top surface of the Stok cast iron grates is rounded. The grill marks from these cast iron grates aren’t all that great, but they definitely have the cast iron thermal performance. The Craycort Cast Iron grate is multiple pieces. There’s a cast iron ring and cross-bar that supports the individual grate sections. 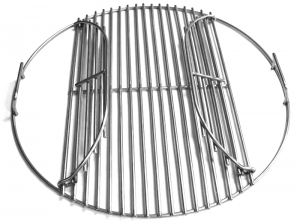 The cast iron grate for the 22″ and 26″ Weber grill has 4 sections while the 18″ has three. Amazon carries Craycort cast iron grates for the Go Anywhere, Smokey Joe, 18″, and 22″ grills. 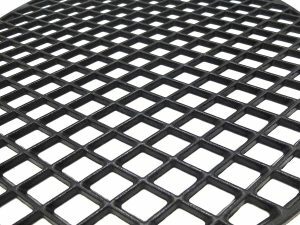 Grates for the Weber 26″ grill are sometimes available on cast-iron-grate.com.